Tyrone’s Sean Cavanagh on the issue of sledging in the GAA. Sean Cavanagh in action for Tyrone against Donegal on Sunday. 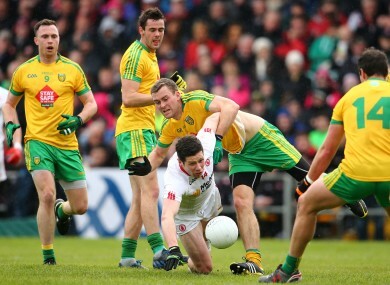 THE ULSTER CHAMPIONSHIP started with a bang on Sunday with a dramatic and heated affair between Donegal and Tyrone. There was plenty talking points after a physical encounter in Ballybofey. We caught up yesterday with Tyrone’s Sean Cavanagh and the five-time Allstar winner particularly addressed the issue of sledging which surfaced on Sunday. Do you feel you were singled out and targeted on Sunday? “Well it’s hard to know. I haven’t watched the game back. But certainly there were a number of incidents, things that you would like to see dealt with more sternly. But until referees get help it’s not going to change. Until sideline officials and umpires start being really brave, and make calls to change things, it’s not going to change. “Well, there were a few verbals, and I was involved in a bit of that. Then as I turned around there was a flash point in front of the tunnel, by then I was a fair bit back. “There was a lot of mouthing, pushing. Sometimes players can normally control each other, but when you see people not normally involved in the game, then the whole thing kicks off. Was the sledging particularly worse yesterday? “There’s no doubting that you’re going to get that, the higher the level you go and the more local rivalries you get. Cavan play Monaghan this weekend and I’ve no doubt it’ll be rife there as well. How do you police it or is it impossible? It’s impossible. I can look that way and call you a name and say something about your family and your child and no one will ever know. “I’m sure Michael Murphy got chatted to yesterday when he was hitting free kicks, I got chatted to whenever I was hitting free kicks. I think they can probably be more stringent on that. Are they researching family history? “Yeah at times, yeah. It can be very, very personal. I know yesterday there was certain players, youse will probably know that plays for us that have been through tough times, and they were getting a fair bit of personal abuse. “Look, it’s disappointing to see and it’s not just all one side. It’s both sides. I don’t know how you can stop somebody whispering in somebody’s ear. Referees and officials will obviously try and clamp down on it but I’m not sure how they can do that. It actually doesn’t really annoy me. I think it’s tougher for guys that haven’t really had that before. Sean Cavanagh with his daughter Eva and his childhood hero Mattie McGleenan at the launch of Super Valu's 'Kits for Kids' initiative. Fear that a young player may decide enough is enough? “People will take that differently. I am accustomed myself not to take that personally and sort of laughed it off through the years. “There is so much now on mental health of players and there are players in dark places. You would hope that it doesn’t come to the stage that some player tries to do something silly or something like that, if he has been abused or has had a bad game and people have really got on his case. You can only try and encourage the players to respect one another. At the end of the day we all have to look at each other when we are walking off the pitch. Ever meet them at functions and that feeling lingers? “I would be fortunate in that I would always try and shake their hands, no matter how gut-wrenching it is going through that 70 minutes. “I could probably sit down with a pen – I’m not going to but I could – and write down a list of 30 or 40 players over the last number of years that wouldn’t have endeared themselves to me. Hard to imagine another sport where that kind of thing goes on? “You watch a bit of NBA and basketball and there will be a bit of thrash-talking. But whenever it gets deeper down into family history, girlfriends and wives, it gets a bit malicious at that stage. Email “'Whenever it gets deeper down into family history, girlfriends and wives, it gets a bit malicious.'”. Feedback on “'Whenever it gets deeper down into family history, girlfriends and wives, it gets a bit malicious. '”.